If you like fishing, but don’t enjoy the sea sickness and solitude of a small boat, the Electric Kontiki could be an option. It's a long line system that allows you to indulge in other beach activities while it is doing the work. 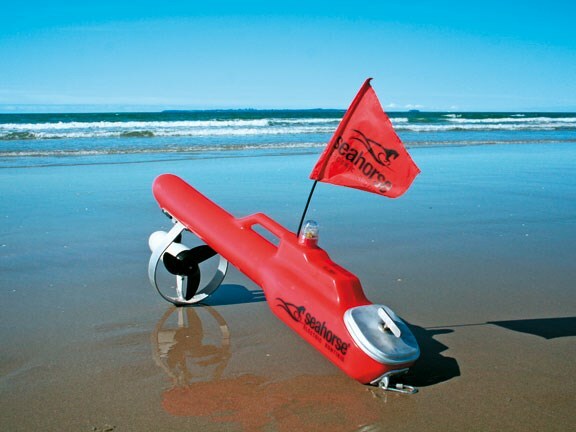 The Seahorse Electric Kontiki fishing system is manufactured by Seahorse Equipment Ltd, which recently moved into its new premises in the Lakes Industrial Area at Tauriko on the outskirts of Tauranga. Phil and Tracy Scherer purchased the business almost two and a half years ago and since then have spent the time getting to know the product, streamlining manufacturing processes, and making improvements as they determine the need. Almost all components are New Zealand-made, with the exception of the motors, which are the same as those used in Mercury electric outboard motors. The business manufactures and sells approximately 1000 kontikis each year to fishing enthusiasts who come from nearly all walks of life –mostly in New Zealand but increasingly to overseas clients. The kontiki concept of fishing off the beach is a wholly New Zealand one, first introduced over 30 years ago. 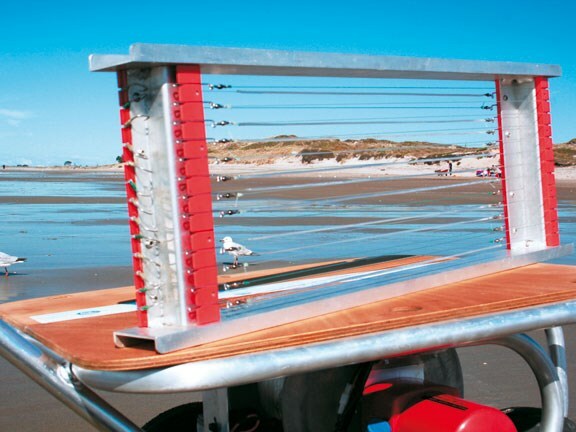 Kontiki fishing, like surf casting, is a great family sport as the children can enjoy themselves on the beach while waiting for the fish to bite, and the compact system can be carried in most car boots or motorhome storage spaces. A line set up with traces and baited hooks is carried out beyond the surf by the kontiki and then left to fish before being pulled back into shore. From humble beginnings based on a raft with a sail, the original kontiki fishing system developed into a catamaran craft, usually about one metre long with a square sail to propel the contraption out beyond the surf. Nearly all of these were owner-built and developed through trial and error. Early morning is usually found to be the most suitable time for kontiki fishing, utilising the land breeze generated by the higher temperature of the sea compared to the land mass at that time of day. The land breeze also flattens the height of the surf. The leader line was attached to the kontiki, traces with baited hooks were attached to the longline according to the fisherman’s preferred configuration, and the kontiki launched off the beach. When the kontiki reached the required distance, the sail was lowered, the sinker released and the kontiki pulled back into shore on its retrieval line, leaving the longline in position on the sea floor. The kontiki’s mast was hinged to fall forward when released, making it easier to pull back to the beach, usually by hand. The release mechanism was pure Kiwi ingenuity. The mast backstay was run through the rear cross beam of the hull and held in place by tying it to a barley sugar, which was too large to fit through the hole. As the kontiki sailed out to sea the barley sugar slowly dissolved in the seawater until it finally let go, releasing the sail to fold forward and dislodging the sinker to drop to the sea floor. A far cry from the technology used in the Seahorse Electric Kontiki, which utilises a polyethylene injection moulded torpedo shaped hull housing batteries and electronic controls with an electric motor driving the propellor slung underneath. The propellor is fitted at the front of the hull to provide better directional control and is protected by an aluminium guard. A hatch in the rear of the hull provides access to the inside of the housing for any maintenance required on the electronics and also to replace batteries. The batteries give a life of 20 minutes at high speed and 40 minutes at low speed, allowing the kontiki to take the line out to just under 2km when set at low speed and conditions are right. For night fishing, the Seahorse Kontiki is fitted with a sealed strobe light on the top of the housing. The distance the line is to be taken out is controlled by an electronic timer, the life of the battery, or the winch. If the fisherman wants to stop the kontiki within the set time, the winch on the beach can be braked and the line payout stopped. The kontiki motor will continue to run until the timer switches off or the batteries run out of power, but of course won’t go out any further. The line consists of 1600 metres of main line, 160 metres of pre-stoppered line to which the traces are attached as the line runs of the winch and 150 metres of leader line. A sinker is attached between the leader and the pre-stoppered line. To launch the kontiki it is attached to the leader line and taken to deep enough water to immerse it. Then the motor is started and the kontiki is placed in the water pointing in the right direction. If necessary a small rudder on the front of the housing can be set to direct the craft into a current or wind. The stop, start and speed controls are fully enclosed inside the housing, with switching activated by a small hand held magnet passing over the electronic control box inside the housing. In still water the long, low, narrow hull and the towed longline holds the kontiki in a straight line as it powers off the beach. The same shape allows the hull to pierce surf waves without deviating. The line is fed out off the beach winch as the kontiki drives out to sea. As the pre-stoppered line comes off the winch baited traces are clipped on and pulled off the bait board. 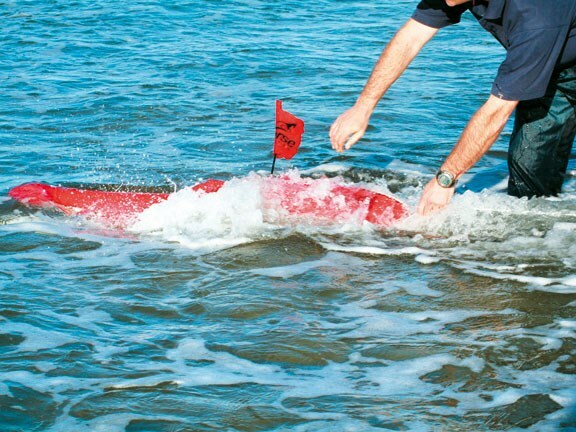 Paying out the line and attaching the traces is similar to the system that is used in commercial long line fishing. The winch has a rubber drag brake to prevent the drum overrunning while the line is pulled off and can be slowed or stopped to assist with attaching the traces by applying pressure to the drum. 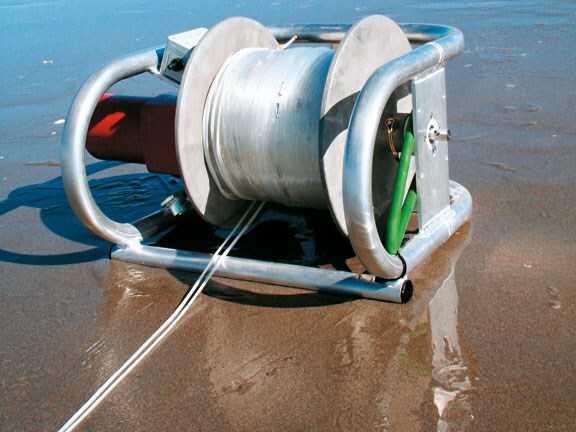 The winch is on a strong tubular aluminium frame designed to enable one person to handle its operation easily and ensure that it sits firmly in the sand. 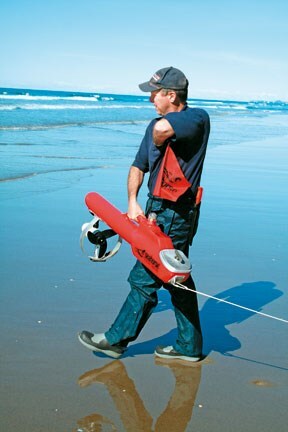 For retrieving the line, the winch has three speeds, plus an on/off switch and a pulse switch. The pulse switch is extremely useful when detaching the traces as the stoppered line comes in – hopefully loaded with fish. Pushing the pulse button starts the retrieve while releasing it stops the retrieve. Thus allowing one person to clear the traces without trouble. 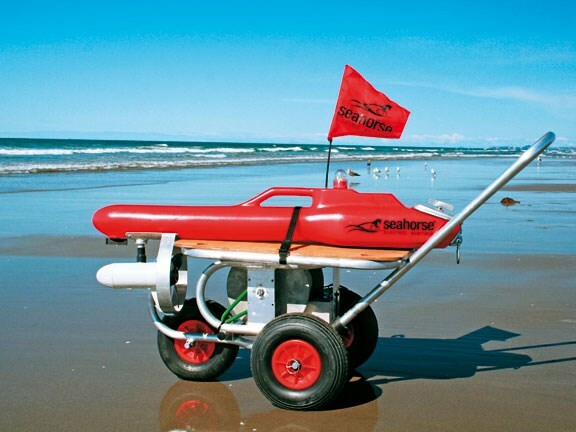 The winch motor and controls are sufficiently water tight to prevent damage should it get hit by a wave or wind blown sand while on the beach. 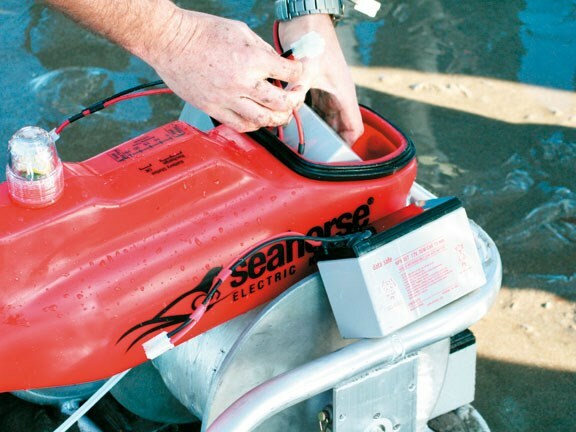 The Seahorse system includes an aluminium beach trolley for ease transporting the gear from the vehicle and along the beach. It has large wheels to prevent the loaded trolley sinking into the sand and is also collapsible, allowing the complete system to fit into a reasonable sized car boot. Our review was carried out at Papamoa Beach near Tauranga, with a small westerly wind blowing and a small surf. The kontiki was carried to the waters edge with the leader line, pre-stoppered line, and main line attached. The motor was started out of the water and after pointing the kontiki in the predetermined direction to allow for currents or wind, it was lowered in to the water with a flurry of spray and released. It set off on its journey straight out to sea with an air of determination. Knocked slightly off course by a small wave at the edge of the beach, the weight of the towed line quickly pulled it back on course. Its tall mast, with red flag attached, marked its position easily as it continued out toward the horizon. At about 1500 metres, the flag was still relatively visible, though difficult to pick up again once your eye was taken off it. At the 1900-metre mark the batteries lost power and the winch drum stopped. The line was left in place for about an hour before the retrieve started. This merely involved starting the winch in high speed and guiding the line onto the drum with a boot to ensure that it was evenly distributed on the drum as it came in. The 150-watt 12-volt Mercury electrical motor provides about 50kg of pull, which will handle anything but a monster haul. Unfortunately that is not an expression that describes our result. After about 10 minutes the first of the hooked fish appeared in the surf and was dragged up the beach. The next two appeared shortly after and that was it. Three gurnard for our troubles – and one of those did not quite make the minimum length and was released back into the water. As the traces came up the beach the winch was paused and the traces – and fish – were easily removed from the main line. To complete the operation the traces were clipped back onto the bait board, the fish placed into the ice box and the kontiki prepared for another voyage out to sea. For the laid back fisherman the Seahorse Kontiki offers an inexpensive, relaxed fishing experience that completely eliminates guilt about the cost of fuel, thoughts of sea sickness, or fishing from the confines of a small boat, and allows you to indulge in other beach activities while the kontiki is doing the work of catching fish.